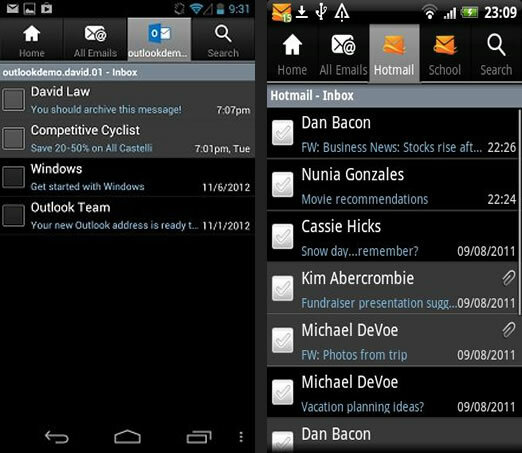 A leading software company Microsoft have officially launched apps for the android device for Microsoft outlook. New outlook dot com works only in selected version. Clearly, Outlook dot com apps is simply the copy or adoption of the Hotmail app which is present in the Google play store from a years ago. Earlier this year Microsoft Outlook dot com web based mail service was rebuilt. Four months later, the company has now released to access the service on Android app. The app works looks sharp but short of some service forms, such as Multiple Account Feature is not available. Of course, users of Android devices, which used to use Outlook dot com app, the old user interface and sync problems are not too happy. Users need the login details of Microsoft accounts and by just device gets sync. instead of working on Outlook dot com app, Microsoft expected to work in Microsoft Outlook app. Initially Microsoft is working for the office productivity for Android Platform and users are expecting that outlook app is also there for this platform.